A golfing adventure on the “most amazing Island in the world” … Bali! As the most famous island in Indonesia, Bali blends spectacular mountain scenery and beautiful beaches with warm and friendly people, a vibrant culture and luxurious resorts. Also known as the Land of the Gods, Bali appeals through its sheer natural beauty of looming volcanoes and lush terraced rice fields that exude peace and serenity. This exotic island has much to offer, from inspirational spirituality to fine dining and meeting experiences, from world class surfing and diving to exhilarating treks in the wild. 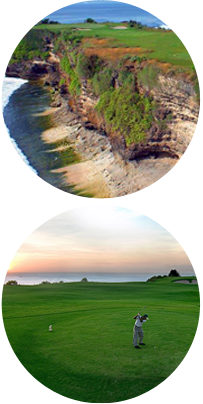 But, as importantly to keen golfers, Bali has some wonderful, international standard golf courses that are both challenging and memorable to play. 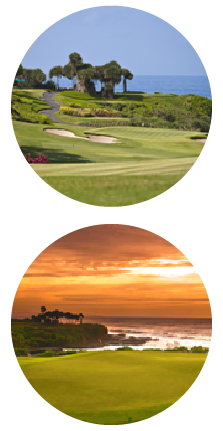 International Golf Specialists (IGS) offer tailored golf packages to Bali that include the very best the island has to offer the keen golfer. Take an IGS Bali golf package and prepare yourself for an enjoyable and memorable golfing experience … in the Land of the Gods! Our Bali golf packages range from 3 to 7-nights and include accommodation from 3 – 5 star hotels and resorts. Prices start from $1,050 and provide the following inclusions. Comfort and convenience with an Indonesian touch! Hotel Santika Siligita is located in the heart of Nusa Dua. Set alongside pristine beaches and calm waters, as well as world-class convention facilities, this 3-star hotel is a prime destination for business travelers and leisure seekers alike. The elegant Superior Room provides a calm and relaxing ambience with natural colors and refined furnishings. Hotel Santika Siligita Nusa Dua provides the ultimate in comfort and relaxation for travellers to Bali. Grand Whiz Hotel Nusa Dua is equipped with 130 rooms in homey setting with comfortable interior design wrapped in natural modern setting. Located in the exclusive business hub of Nusa Dua Resort, a well-known area for international events, the hotel is the right place for business and leisure travellers to spend their stay in Bali with high quality of services. This four-star hotel can be reached only 20-minute drive from Ngurah Rai International Airport, 5 minutes from Bali International Convention Centre. The hotel is only 300 metres away from Nusa Dua beach, where you can do water sports while enjoying the breathtaking panorama on the island of gods. The Grand Bali Nusa Dua offers a truly Balinese experience of serenity and personal hospitality. With 63 deluxe, suites and pool villas, a private beach club, spa and authentic dining experience, The Grand Bali Nusa Dua is an ideal haven to escape, unwind and enjoy peace of mind. Traditional Balinese warmth combined with genuine service makes it an ideal choice for a serene getaway. Set in the exclusive enclave of Nusa Dua, the resort’s spacious and luxurious suites and pool villas are decorated in contemporary Balinese style and fully-equipped with modern amenities for uncompromising comfort. Our hotel boasts the largest 55 square metre Deluxe rooms within the Nusa Dua area. Located on the shores of Nusa Dua, Bali's prestigious resort enclave, this beachfront resort is a unique sanctuary of exotic beauty and comfort for those who seek a dream vacation. The entire property occupies 10.7 hectares of lush tropical gardens with an enormous lagoon swimming pool winding throughout the grounds. The contemporary tropical architecture, bold décor, and spacious gardens express the essence of Bali. The resort enjoys an excellent location just 12 kilometres from Ngurah Rai International Airport. It's within walking distance to Bali Collection, the main Nusa Dua shopping centre, and to food and entertainment malls, a museum, and Bali Convention Centre. Bali National Golf Villas feature seven luxury appointed two and three-bedroom villas each with panoramic views over the golf course, complete with private swimming pool, Butler Service, 24-hour in-villa dining and 24-hour security. Bali National Golf Villas are proud to offer its guests a unique and incomparable style of service. During the stay, all of our guest’s requests and enquiries are taken care of by the Personal Butler who is exclusively appointed to meet all of our guest’s wishes. Bali National Golf Villas is your place to enjoy the good life in absolute comfort. It is very private, very personal and we are proud to say, a very different experience from the rest. With only a 20-minute drive through Bali Mandara toll road from Ngurah Rai Bali International Airport, Bali National Golf Club offers visitors to Bali a truly luxurious golfing experience. Bali National Golf Club, located in the Nusa Dua tourism complex which offers a number of star rated hotels, two Convention Centres, a modern Shopping Centre, Restaurants and a Museum, sitting alongside over three miles of white sand beaches. With only a 20-minute drive through Bali Mandara toll road from Ngurah Rai Bali International Airport, Bali National Golf Club offers visitors to Bali a truly luxurious golfing experience with the redesigned Bali National Golf Club who has three distinct playing environments throughout the 18-hole course. Holes 1 through 9 feature creeks, canyons and native vegetation filled with tropical birds, whilst holes 10 through 16 offer the golfer lush gently sculptured fairways through a mature grove. Finally, the island green hole 17 and lakeside hole 18 are the challenging finishing holes to test every golfer. The course was awarded Best Renovated Golf Course in Asia 2014, 3rd Best Renovated Golf Course Worldwide 2015, 5th Best Golf Resort in Asia Pacific 2016 and Best Golf Resort Indonesia 2017. Carved out of harsh limestone and edged between the brilliant white limestone cliffs and the endless blue horizon of the Indian Ocean, this championship golf course ranks among Asia’s best and most challenging. Experience this championship layout first hand to discover much more than just a golf course. A magnificent Clubhouse with one the best venues boasts a restaurant, bar, spa and function rooms with panoramic views of the lush rolling fairways and sea. Overlooking the 9th and 18th green of the golf course, the Link Restaurant is open daily from 6am for breakfast, while also catering for lunch, morning and afternoon teas as well as light snacks all day until 7pm. Dine in air-conditioned comfort amid a backdrop of lush rolling fairways, native landscape and rolling waves of the Indian Ocean. Opened in October 2016, Bukit Pandawa Golf & Country Club is the latest addition to Bali’s growing collection of world-class golf courses. Situated on a limestone cliff-top overlooking the world-famous surf breaks of Bukit Peninsula, the singular venue offers 18 championships par-3 golf holes, many of which are back-dropped by rustic architectural relics and spectacular views of the Indian Ocean. The Bukit Pandawa Golf & Country Club has just been awarded the 2017 “Best Par 3 Golf Course in the World” by World Golf Awards. With a clubhouse inspired by the many grand temples Bali is renowned for, the club is the centrepiece of an expansive development that will eventually include several 5-star hotels, including a Waldorf Astoria, Mandarin Oriental and Swissotel. With the course routed through dramatic limestone rock outcroppings, Bukit Pandawa Golf & Country Club is the first golf course of its kind on Bali … a unique and must play golfing experience! International Golf Specialists also offer a range of custom golf packages and tours to suit each individual.